We’ve just had the coldest, snowiest winter in a long time. A great opportunity to look at some of the science (and beauty) of snow. We’ve all heard that no two snowflakes are alike. The discoverer of this factoid was an unlikely candidate. 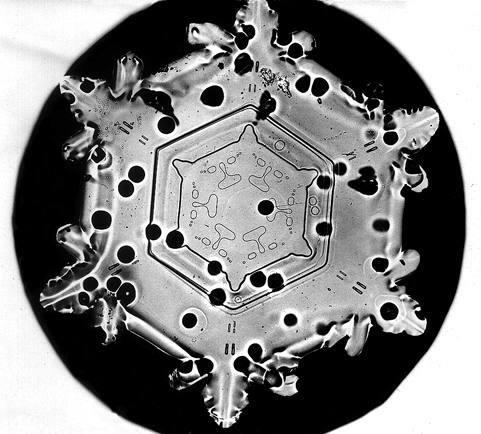 Wilson Bentley, “The Snowflake Man”, was a self-educated farmer who adapted a microscope to a camera and pioneered microphotography. 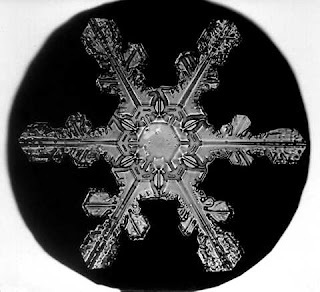 His photographs of snow crystals attracted world-wide attention. He photographed over 5,000 snowflakes – no two identical. 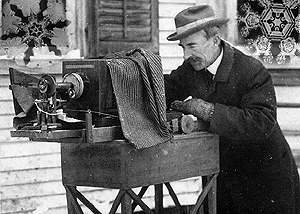 Wilson Bentley with his bellows camera. 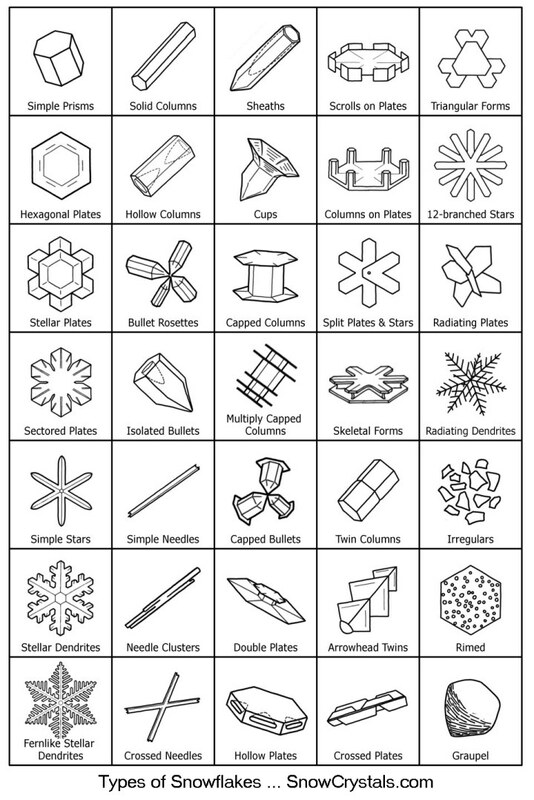 Many, but not all snowflakes look like these six pointed stars. There are many other forms. 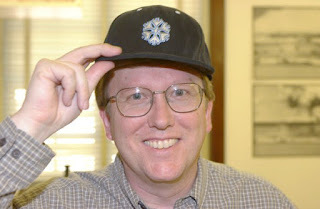 Professor Ken Libbrecht of Caltech (California Institute of Technology) could claim to be the modern “Snowflake Man”. 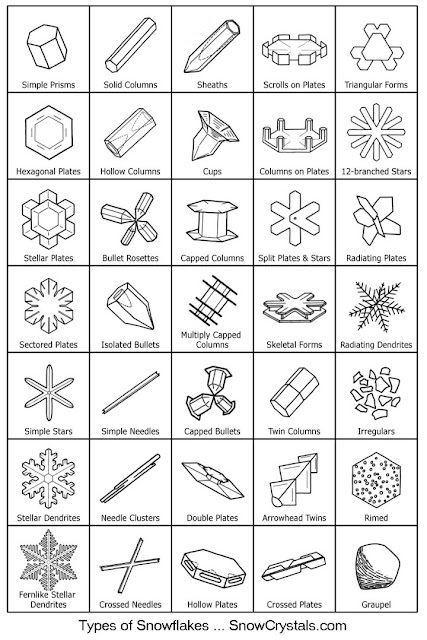 The diagram below from Professor Libbrecht's website shows the many forms of snow crystals and how different ones are likely to form at different temperatures. Most crystals are six-sided because of the geometry of the water molecule, with two hydrogen atoms bonded to an oxygen atom. Any two snowflakes in nature have experienced different paths on their journey to the ground, so are different from each other. But the six sides, or arms, are almost identical to each other because all six sides are subjected to almost identical atmospheric conditions in their path down to the ground. 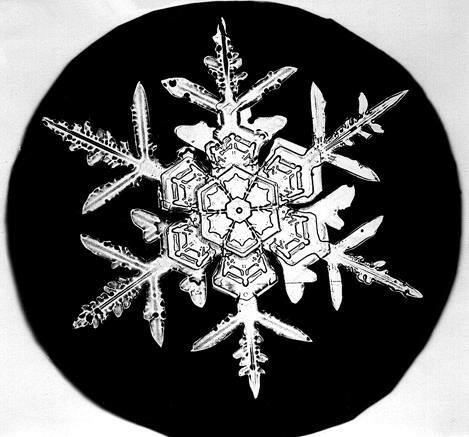 Dr. Libbrecht has grown pairs of snowflakes in his lab, subjecting them to the same conditions. And, sure enough, virtually identical ‘twin’ snowflakes are created. Go to the link below and click on "Growing Twin Snowflakes" to see some spectacular videos showing the crystals growing side by side. This winter we had lots of opportunities to walk on squeaky snow. If you live in a cold snowy region you know what I’m writing about. If you don’t: walking on snow is very quiet unless the temperature is quite low, and then you hear a distinctive squeak when you tread on it. So what is it that makes the noise? Oddly, for such a common phenomenon, there isn’t a single agreed-upon explanation. Or perhaps not so oddly. As one scientist observed on the subject “They don’t give out Nobels for explaining why snow squeaks”. There is general agreement that snow squeaks at temperatures of -14°C and below, and not above that temperature. The most likely explanation is that the squeaking is made by the breaking of snow crystals as they are forced into each other. There’s less agreement on why the snow is silent above that temperature. One common explanation is that it’s the pressure of your foot. Increasing pressure lowers the melting point of ice. So at temperatures from 0°C to -14°C enough of the ice in the snow crystals will melt and they’ll slide past each other quietly. One problem with this explanation: pressure doesn’t change the melting point all that much; not enough to melt ice at -14°C. A more likely explanation is this: the surface of ice is always covered by a layer of water. The colder the temperature, the thinner the layer. At -14°C it’s only one or two molecules thick. When the temperature is higher than that the crystals are lubricated by the water and slide quietly past each other as they compress. Michael Faraday (most famous for his work on magnetism and electrochemistry) first suggested in the 1850’s that this layer of liquid exists. Scientists have subsequently confirmed it. Mr. Michael Faraday (he turned down a knighthood, preferring to remain “plain Mr. Faraday to the end”) at the age of about 70. He was self-educated, initially through reading books during his apprenticeship as a bookbinder and bookseller. This layer of water is also the explanation of why ice skates glide. For more on that, look (again?) at my blog entry in February of 2017 on the subject. And the best news about all of this is that Spring is here and we won't be hearing squeaking snow for many months.